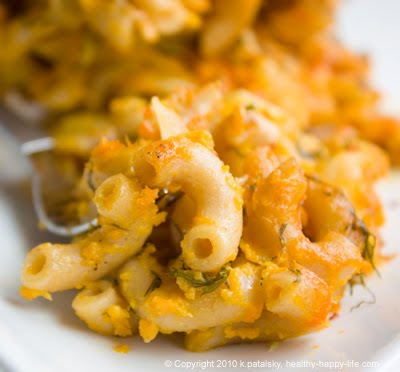 Vegan Mac and Cheese Recipes. My previous vegan Mac n Cheese recipe posts have been 100% nutritional yeast free. But now that I have embraced my new-found love of nutritional yeast flakes, I've also fallen in love with my two new pasta recipes. Mac n Cheese Basics. There are two basic ways to prepare mac n cheese: straight-up pasta folded into sauce, or you can take a second step and bake the mac n cheese. Baking mac n cheese marinates the cheesy flavors into the pasta. The pasta becomes super tender, and the sauce reduces a bit to make a thick and hearty bite, rather than a 'wet' bite. 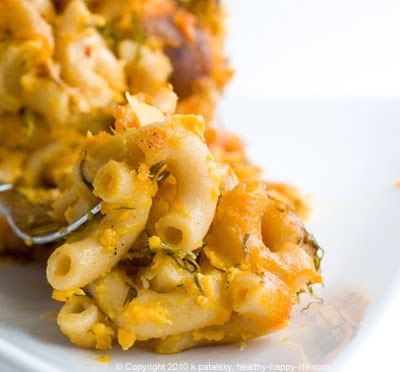 Baked mac n cheese can be topped with vegan cheese, breadcrumbs or even fresh veggies and/or herbs. My Two Recipes. My first recipe, is a "from scratch" recipe using nutritional yeast as the flavor base of the sauce. Sweet potato also adds flavor, sweetness and texture to the sauce. 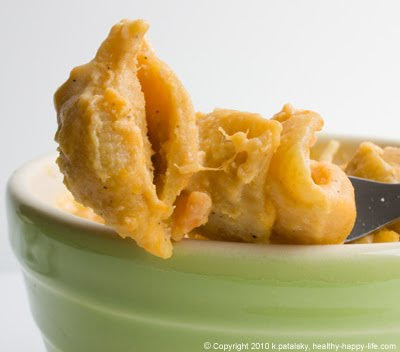 The second recipe easily uses Edward and Son's boxed mac n cheese, with a few added flavor ingredients. However, you can easily make the mac in recipe one and substitute it for the boxed mac in recipe 2. So it's your choice - make the sauce from scratch - or use a boxed powder. Mac Virgins. If you've never tasted nutritional yeast based vegan mac n cheese before and don't want to invest in a giant canister of nutritional yeast - the boxed product from Edward and Son's is a good test-run route to taste. Mac Recipe #1 of 2..
* For a ultra-rich n creamy sauce, use half soy milk/half soy creamer as liquid. 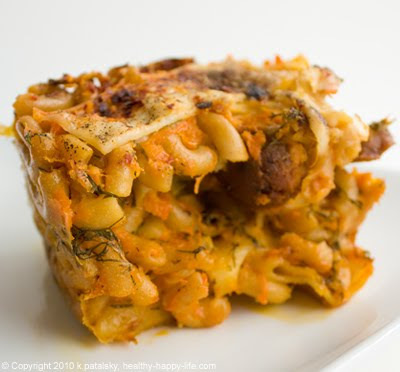 * You can bake this pasta and add a thin layer of vegan cheese on top to get that bubbly baked look and taste. * 1 Tbsp of Vegenaise - adds a sweet creamy accent. 2. Heat your sweet potato - about small to medium sized - in the microwave or oven. Heat until cooked through. 3. Boil some salted water on the stove and drop your pasta for cooking as directed on box/bag. 4. While your pasta is cooking, add your nutritional yeast flakes, garlic powder, pepper, vinegar and soy milk to a large mixing bowl. Stir well. 4. Finely chop your onion and add it to the mixing bowl. Mix. 5. When your sweet potato is ready, peel off the skin and mash it well. Scoop about 1 cup of the mashed sweet potato into your mixing bowl. Mash it well into the liquid. You should get a nice thick creamy orange sauce. You can always add more liquid if you'd like a thinner sauce. And you can add more sweet potato if you'd like it super thick and a tad sweeter. You can even add in more nutri-yeast flakes for an extra strong nutty 'cheese' flavor. 6. Drain your cooked pasta and drop it right into you mixing bowl and fold in the sauce. You won't need to heat the pasta 'cheese' sauce separately because the warm pasta will provide heat. However, you can keep the pasta warm in a 180 degree oven, or re-heat in oven or microwave as needed. Serve and enjoy some easy vegan comfort pasta! 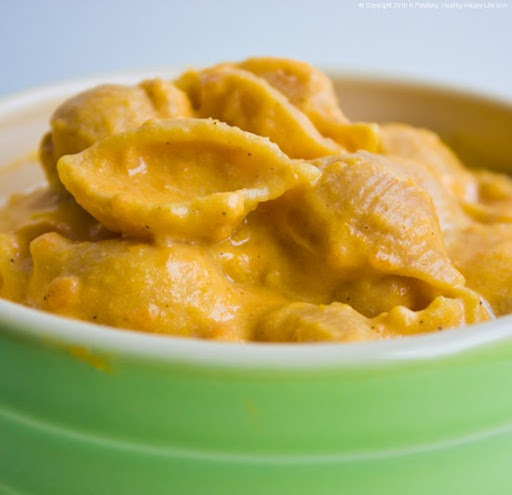 NOTE: If you don't have an Edward and Son's boxed mac n chreese, you can use the above 'nutritional yeast mac' recipe and make your own pasta and cheese sauce from scratch, - boxed or from scratch - either way will be delicious. *If you use the nutritional yeast recipe, omit the sweet potato and onion from this baked dill recipe. 1. Bake your sweet potato. 2. Thinly chop your onion. 3. Boil some salted water and drop your pasta (boxed or your own variety). 4. 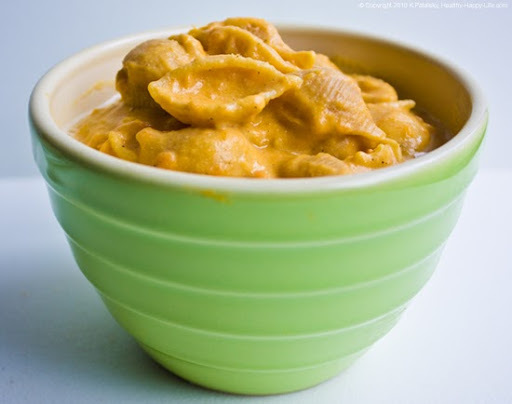 In a large mixing bowl, add you own from scratch nutritional yeast sauce (recipe above) or add the boxed mac powder pack the the bowl and add in the remaining ingredients - soy milk, onion and mashed sweet potato. Mix well until a nice creamy sauce forms. 5. Add your cooked pasta to your sauce, and fold well. 6. Chop your vegan sausage into thin rounds and fold into pasta. 7. Lastly, fold in your chopped dill. 8. Pour your pasta into a medium sized bread pan or a small casserole dish. Cover with a thin layer of vegan cheese. I use Follow Your Heart brand Monterey Jack cheese. You can drizzle with some optional EVOO if you'd like as well. Tomato-y Idea: You can even add a can of whole San Marzano tomatoes to the bottom layer of this dish if you'd like. Use a larger dish if you add the tomatoes. 9. Place uncovered, in hot oven on broil for 4 minutes. Then reduce heat to 350 degrees, cover pasta with foil, and bake for additional 10-15 minutes. Keep in warm oven until ready to serve.